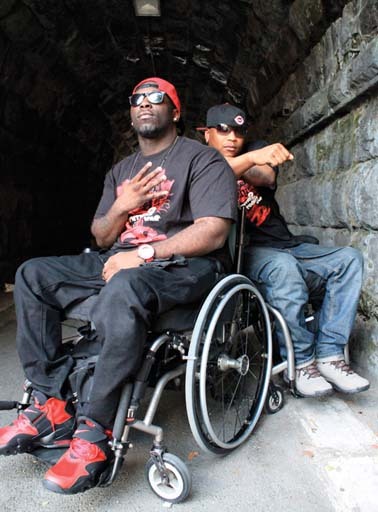 4 Wheel City is an entertainment organization started by Namel "Tapwaterz" Norris and Ricardo "Rickfire" Velasquez two talented hip-hop artists and motivational speakers in wheelchairs due to gun violence. Their mission is to use hip-hop music and culture to create more opportunities for the disabled and inspire people not to give up in life. In addition, show the world that people with disabilities can still have talents, dreams, and deserve to be treated equal. 4 Wheel City performs original music as well as motivational speak at hospitals, schools, rehabilitation centers, fundraisers, and events, all over the world. Ricardo Velasquez was walking home after a party when he noticed a commotion ahead of him, with people running in all directions. Determined to mind his own business, the high school senior kept heading toward his building in the Bronx housing project. Suddenly he heard someone shout, He’s got a gun! Ricardo adds "The next thing I know I’m on the ground bleeding, I was screaming, and it was crazy. It happened just that quick." A resident of the same New York neighborhood, 17-year-old Namel Norris was at his sister’s birthday party when his cousin started playing with a gun. The weapon accidentally fired, striking Namel in the neck and paralyzing him from the chest down. The two young men had never met, yet they shared much in common. Both sustained spinal cord injuries and were in wheelchairs. Both felt shunned by the people they used to hang out with. Ricardo says "The most difficult part, was seeing how people pulled away from me-friends, family members. It’s not fair". A few months after Namel’s accident, his mother spotted Ricardo in the building next door, introduced herself. She asked Ricardo "Will you be my son’s friend? He doesn’t know anyone else in a wheelchair". Ricardo agreed-he too had struck up a friendship with another spinal cord injury patient while in rehab and he and Namel’s mom swapped phone numbers. Namel was skeptical at first but decided to visit Ricardo. He adds "I think it was out of convenience a little bit. just saying, ‘Well it can’t hurt.'" Ricardo Velasquez, a budding music producer who had emigrated with his family from Honduras three years before the shooting, was in his apartment throwing some beats when Namel Norris arrived. The two men struck up a conversation about the hiphop business and realized they shared similar goals. In the coming months, they launched 4 Wheel Records, with Namel Norris as solo artist and Ricardo Velasquez as producer, and completed two albums. In 2006-the same year Namel earned his bachelor’s degree in business management from Lehman College the two men officially launched 4 Wheel City, a broader, non-profit movement to inspire, educate, advocate, and entertain. Tapwaterz Norris and Rickfire Velasquez started performing their rap therapy at nursing facilities and rehabilitation centers. They visited patients at New York’s Mount Sinai Hospital, where they’d both received treatment, and found themselves mentoring other young people with newly acquired disabilities. At schools and colleges, they encouraged teens to stay in class and warned them of the consequences of inner-city gun violence. Namel adds "And we just started seeing a need for people to have someone they could identify with, you know, maybe get a little inspiration or information". The duo also played at radio stations and performed their edgier music at local clubs. Namel says "We have two sides to what we do, and we try to do them both with the same mission, the same purpose, we do music to inspire people". At VH1's Hip Hop Honors Awards in 2006, they interviewed rap artists and other celebrities in the industry. They were nominated for an Underground Music award, designated one of 50 Unsung Heroes by the New York Daily News, and featured on CNN and ABC World News Tonight. In one of 4 Wheel City’s first songs, The Movement they rapped about problems people with disabilities often have with public access. Another number, Welcome to Reality focuses on the importance of finishing school and making the right choices. Gary Delamothe, the duo's tour manager adds "In the urban community, where there is unfortunately a lot of violence, a lot of guys and girls end up in wheelchairs, and they don’t have no one to look up to. Namel and Rick sort of became their voice". In the fall of 2008, 4 Wheel City performed in seven cities from New York to Orlando, FL. They both spoke to audiences along the way to build awareness of disability issues; at rehabilitation centers, they offered moral support to other young people like themselves. Gary Delamothe adds "When we went into Walter Reed [Army Medical Center] in Washington, DC, the soldiers there were so wonderful, they definitely liked what the guys are doing and got the message and want us to come back. For those kids who are in a wheelchair or disabled, they can relate to 4 Wheel City. It can make them want to do something, too". He explains "One patient who’d been recently paralyzed, was mad at the whole world. And when he saw 4 Wheel City and he spoke to Namel and Rick, the nurse said, 'this is the first time he spoke to anybody.’ It really touched me. I actually got to see how deep it really goes". Ricardo says "They support what we’re doing because they haven’t seen anything like this, where two guys get together and promote positive music through hiphop. If it wasn’t for hiphop, I don’t know where me and Namel would be right now. It kept me busy and focused and gave me a new me, really"
4 Wheel City plan to release another CD in the spring and start touring again this summer. They are currently editing a documentary about 4 Wheel City. In the future, they want to raise funds for spinal cord injury research. The best part about 4 Wheel City, says Namel, is "the fact that this has meaning to it. We’ve really been entrenched from the beginning. It’s just real". The duo hope to eventually tour the globe and reach out to people with disabilities in other countries. They want to be recognized for their art, not just their wheelchairs. Ricardo adds "Just because you have a disability, that doesn’t mean that your life is over. We want to inspire other people to go ahead and do things. It don’t have to be music. It can be anything that you have a passion for, or maybe you had it before and you thought you lost it due to your disability. Our main goal is just to try and inspire people to live life to the fullest". "Anything that you want to be or want to do-you can do it. Just put your mind to it," he adds. "Do not believe in the word 'can’t' When you have a disability you get a lot of doubt, from people who say, 'Oh you can’t do this, you can’t do that.' You just prove them wrong by doing it anyway"
4 Wheel City Presents "The Movement"